September 15; According to a nation-wide public opinion poll by PILDAT, conducted at the end of the 3rd Year of the current Federal and Provincial Governments, June 2015-May 2016, a majority of Pakistan’s population expressed satisfaction with the democratic system in Pakistan, with 54% of the respondents subscribing to this viewpoint by saying ‘Highly Satisfied’ or ‘Satisfied’ with quality of democracy. 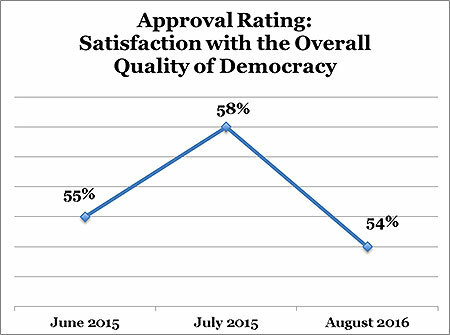 Public satisfaction has been fairly consistent over the first three years of the currently elected Governments on the overall quality of democracy. 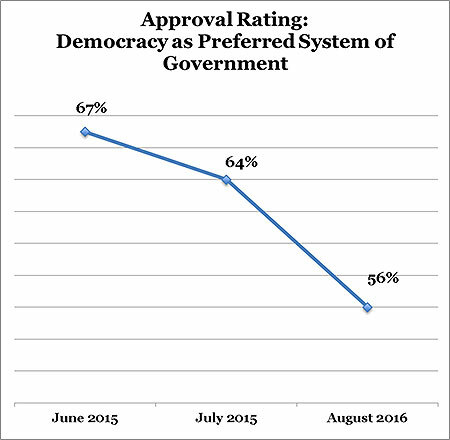 The proportion of respondents who were satisfied with the existing democratic system at the end of 2nd year of elected Governments, June 2014-May 2015, stood at 58%. Moreover, at the end of 1st year of the elected Governments, June 2013-May 2014, this figure stood at 55%. With regards to provincial breakdowns, respondents from Sindh seemed to be least satisfied with overall quality of democracy, with only 32% of the respondents looking favourably upon it. This was followed by Khyber Pakhtunkhwa at 58%, Punjab at 61% and Balochistan at 66%. Support for the overall quality of democracy at the end of the 3rd Year was greater amongst urban section of the country’s population, with 58% of the respondents from urban areas looking favorably upon it, in comparison to 47% of the respondents in Pakistan’s rural areas. Even though satisfaction with the overall quality of democracy remains consistently positive, the favourable outlook with regards to democracy as a system of government has seen a decline of 11 percentage points in 3 years compared to the first year. At the end 3rd Year, only 56% of the nation-wide respondents believe democracy to be the best system of Government, ascompared to 67% at the end of the 1st Year and 64% at the end of the 2nd Year. The people of Balochistan are in the lead in terms of support for democracy over other systems of government, by the end of the 3rd Year of the elected Governments, with 82% of the respondents considering democracy to be the best system of government. Punjab comes in at second with 60% of respondents subscribing to the viewpoint, followed by Sindh at 48% and Khyber Pakhtunkhwa at 44%. A relative minority of 28% of the respondents felt that the military is best suited to govern Pakistan. Of greater interest is that over the course of three years since General Election 2013, this proportion of respondents has risen by 9 percentage points. It stood at 19% at the end of 1st year, before rising to 20% at the end of 2nd Year. These findings are released from PILDAT Public Opinion Poll on the Quality of Democracy in Pakistan for the third Year of the Federal and Provincial Governments, June 2015-May 2016 on the annual International Day of Democracy, i.e. September 15. The survey results are from a two-part PILDAT survey covering separately Quality of Governance and Quality of Democracy. The nationwide poll was conducted during August 18-September 05, 2016 with a nationally representative sample size of 3610 citizens throughout Pakistan.